It's all come down to this. Fight night. The big kahuna. Walla wall bing bang. It's the moment of truth where Blackness has come 'round the bend. It's time to put the kids to bed and determine, who has the #blackestname in America. 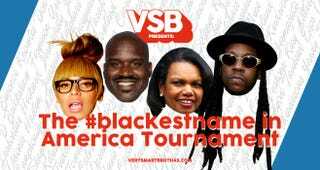 Is it, the queen of WTFificence, Va'Shaundya Karlette Nelson aka Shaunie O'Neal, or is the man who would be king, D'Brickashaw Ferguson. To bring this battle to the mainstream, a few of the VSB writers decided to offer there opinion on who would take the crown. I also asked some folks in the street. What you are about to read is mostly true and also mostly made up. Hey, if Chris Rock can serve chicken at the BET Awards, then I can say what I want to. I smoke crack in the bathroom. I want D'Brickashaw Ferguson to win, I really do, because it's an awesome name. It's a real name that sounds like a nickname given for doing something crazy like smashing a house down with bare fists. But the more I kept on reading and saying out loud, Va'Shaundya Karlette Nelson, the more I couldn't deny our true champion. You know your real name is black when the shortened name is still black, like instead of fried chicken, you ask for baked fried chicken. There's a time to vote and a time to laugh; a time to be Black and a time to laugh at other's Blackness. Now is that time. Vote early, vote as often as it allows. It's time to crown our winner!